Marathon season is coming around again and for many runners the countdown to race day has begun. This is the first of a series of articles in which we take a look at some of the key training sessions if you’re preparing to run 26.2. Training at or just above (or even a mixture of the two) the lactate threshold is a key session for endurance athletes. Lactate is a by-product of the lactic (or anaerobic) energy system, a system that we rely on to help meet energy demands as the intensity of training increases. Your lactate threshold is the point at which lactate starts to build up in your blood, when it is being produced quicker than it can be cleared. Run above your lactate threshold intensity and pretty soon you’re going to have to slow down or even stop. Increase your lactate threshold and you increase the pace at which you can run comfortably, and therefore your potential marathon pace. Lactate threshold is often used to calculate the right paces for each of the different training sessions from the long run through to speed intervals. How do I increase my lactate threshold? Fortunately, we can improve our lactate threshold by training at or just above our current threshold. This can be done through continuous run sessions of 20-40 minutes (tempo or threshold runs) at threshold pace or sets of long intervals at just above threshold pace. How do I calculate my lactate threshold and training paces? 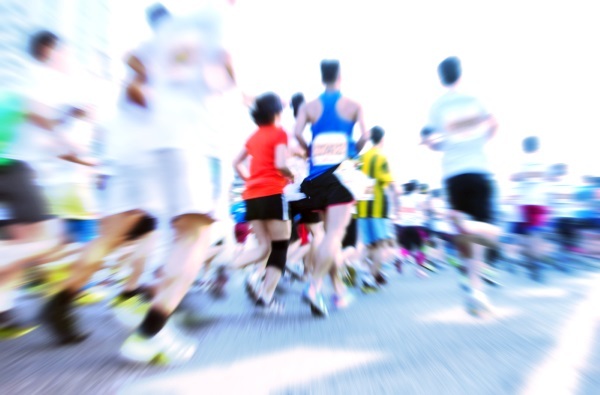 Some sports clinics, universities and labs offer lactate threshold testing. The level of lactate in your blood is measured at intervals as exercise intensity is increased in increments – at a concentration of 4mmol/L you have reached the onset of blood lactate accumulation. American coach Jack Daniels (currently coach to US runner, Ryan Hall) developed his VDOT system using data that he collected over years of coaching runners of a wide range of abilities. Look up your best race times and you’ll see a related VDOT number (an estimation of VO2max). Daniels then provides a range of training intensities (including threshold pace) for each VDOT level. Using the VDOT tables my threshold run pace was calculated as 04:19 min/km. The Conconi test is a field test carried out on an athletics track. Starting slowly, the pace is gradually increased at specific intervals until the runner can no longer keep up, at which point their test is complete. Heart rate is measured at regular intervals during and upon completion of the test. The heart rate data is plotted in a line chart, and the lactate threshold is considered to be the point where the heart rate plateaus. There is some debate about this test, and it can be difficult to interpret the results, but we have found it to produce useful results in most cases. My estimated lactate threshold using the Conconi method was 04:16 min/km. After a warm up, the objective is to run at the fastest pace that you can sustain for the full thirty minutes. Again a heart rate monitor is required to measure heart rate at one minute intervals and an average is taken for the last 20 minutes of the test. This should be the heart rate that corresponds to lactate threshold. Unless you have a good feel for pacing, this test can be difficult to complete. There are a number of online tools and calculators, including our own race time predictor, that estimate lactate threshold based on race performance, and calculate corresponding training paces. As a guideline, it should be a pace you can sustain for approximately 1 hour. The Running4you tool estimated my lactate threshold to be 14.4km/h or 04:16min/km. Whichever method you use, these are best estimates and the result should be used in conjunction with feedback based on recent training and race results, not in isolation.